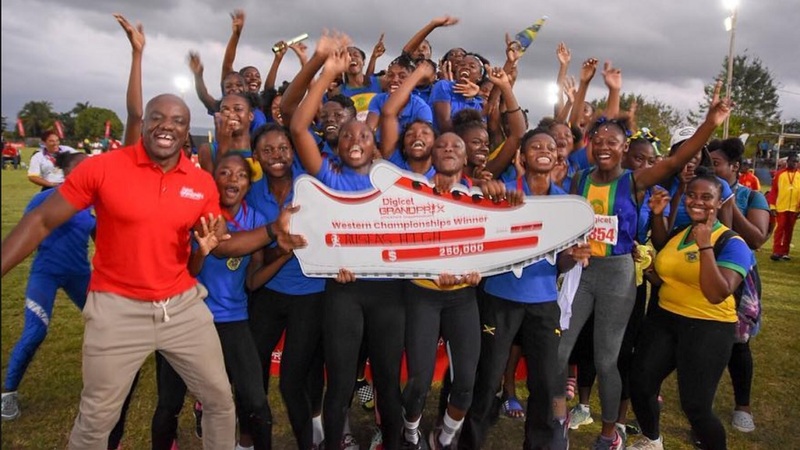 Members of Edwin Allen High's track and field team celebrate after the schools won the girls' title at the Digicel Central Championships, at G C Foster College on Wednesday, March 27, 2019. 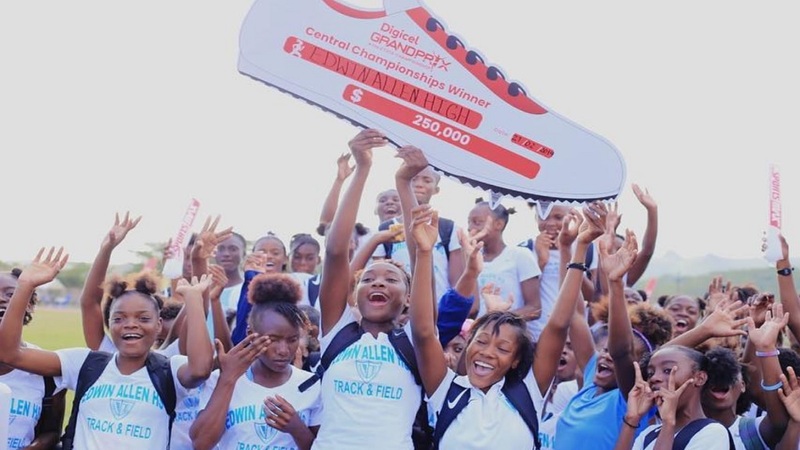 Edwin Allen High and St Jago High have retained the girls and boys’ titles at Central Championships, the second regional meet of the 2019 Digicel Grand Prix Athletics Championship, at G C Foster College in Spanish Town on Wednesday. Spanish Town-based St Jago High proved a cut above their challengers to beat nearest rivals - Edwin Allen High - by all of 152.50 points after entering the second and final day with a 41.5-point lead in the boys' championship. St Jago High compiled 348 points at the end of the 40 finals, while Edwin Allen High ended with 195.50 points. Clarendon College (105), Holmwood Technical High (93.50) and Charlemont High (81) complete the top five. After a ding-dong battle with Hydel High on the final day in the girls' championship, Edwin Allen High pulled away for a 20.50-point victory after entering the day with a 47.5-point lead. At the end of the 45 finals, Edwin Allen High tallied 366 points and Hydel High, 345.50. St Jago High (306.50), Holmwood Technical High (279) and Vere Technical High (131) complete the top five. 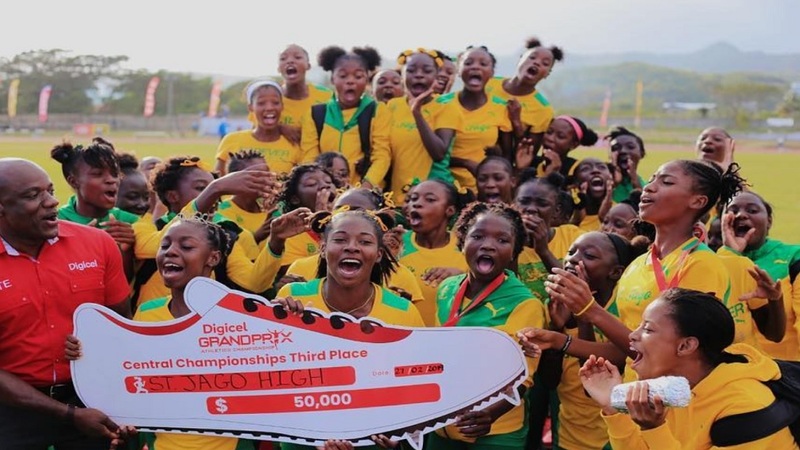 Digicel presented cash prizes to the top three finishers (boys and girls). 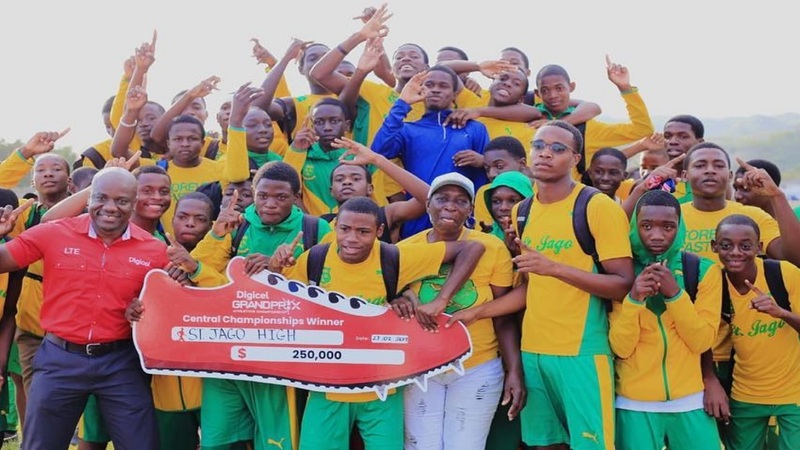 St Jago High and Edwin Allen High were each presented with $250,000 for winning the boys and girls' titles. 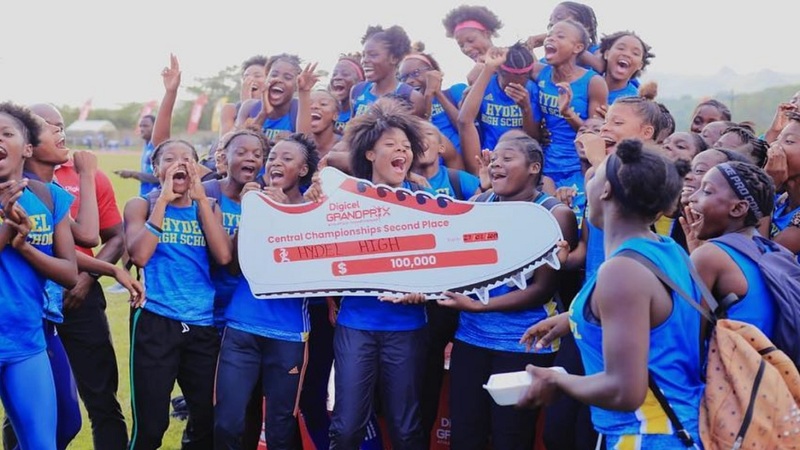 Hydel High (girls) and Edwin Allen (boys) walked away with $100,000 each for second place finishes, while St Jago (girls) and Garvey Maceo (boys) received $50,000 each for third place finishes. Seventeen meet records were broken and one equalled on the day. Tuesday’s opening day produced 14 meet records. Edwin Allen outstanding sprinters Tia Clayton and Kevona Davis were among the athletes who accounted for records on the day. Tia Clayton broke the 100m meet records again. She won the Girls’ Class 3 100m final in 11.37 seconds to shatter the record of 11.70 seconds she set in the preliminary round on Tuesday when breaking St Jago’s Brianna Lyston 2018 time of 11.78. The Hydel pair of Alana Reid (11.82) and Kerrica Hill (11.83) were well beaten into second and third. Davis proved a cut above the field, winning the Girls’ Class 2 200m in 23.24 seconds to erase the previous record of 23.61 seconds she set in 2018. The St Jago pair of Joanne Reid (23.99) and Thennelle Williams (24.04) finished second and third. Edwin Allen’s Aj Sweeney was also in record-breaking form for the second straight day. Sweeney won the Boys’ 5000m open final in 15:45.50 seconds to dip under the previous meet record of 15:56.26 set by Bellefield High’s Tajshae Wilson in 2017. Sweeney came home well clear of the Bellefield High pair of Romoy Grant (16:17.22) and Akeem Tomlin (16:41.76), who finished second and third. Sweeney had smashed the Boys’ 2000m steeplechase open record on Tuesday when crossing the line in 6:04.71. The Girls’ 3000m open record was also lowered as three athletes went under the previous mark of 10:38.29 recorded by Edwin Allen’s Teresha Jacobs in 2016. Three 400m records were also broken. 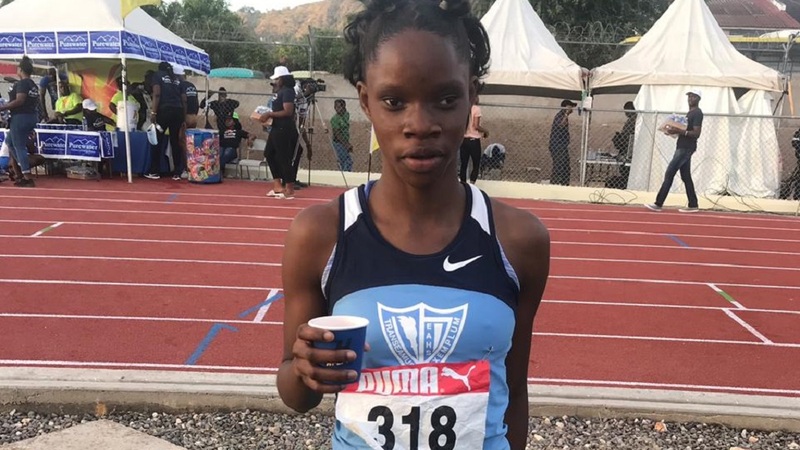 Hydel High’s Oneika Mcannuff won the Girls’ Class 3 400m final in 54.28 seconds to erase the previous record of 54.87 set in 2017 by Holmwood Technical’s Daniella Deer . 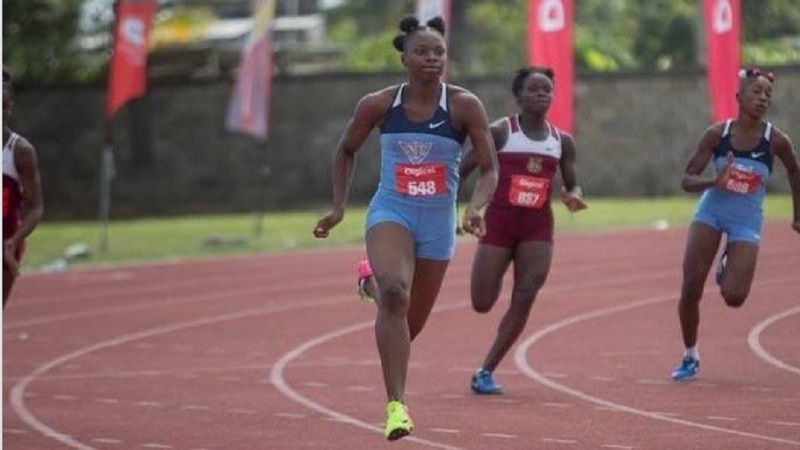 Holmwood Technical’s Rickiann Russell finished second in 54.72, a time which also improved on the previous record, while Clarendon College’s Dejanea Oakley clocked 55.59 for third. St Jago’s Raheem Pinnock won the Boys’ Class 3 400m final in 51.37 seconds to break Zidane Brown’s meet record of 51.63 set in 2016. Charlemont High’s Deshaun Gordon (51.93) and Ferncourt High’s Derrick Grant (52.06) finished second and third. York Castle High’s Anthony Cox accounted for the Boys’ Class 1 400m record, winning the final in 46.46 seconds to dip under the previous meet record of 46.60 set by Bridgeport High’s Malik Smith in 2018. Cox was well clear of St Catherine High’s Tyrece Grant, who finished second in 47.85, and Bovel McPherson of Holmwood Technical, who came home third in 47.87. The four regional meets act as qualifiers for the Grand Finale/GC Foster Classics on March 16.